Address: Taj Ganj, Agra 282001 . Access: 10 kms. from Agra Airport, 6 kms. from Agra Railway Station, 3 kms. from Agra city center. Facilities: 285 rooms, including 2 Presidential Suites and 3 Deluxe Suites, sauna, swimming pool, jogging track, gymnasium, beauty salon, barber shop, children's amusement park, business center, restaurants, conference and banquet facilities. Services: 24-hour room service, Laundry and dry-cleaning service, Doctor on call, Shopping arcade, sports facilities, Lockers, safe deposit and 24-hour money changer, Tour/travel desk, CCTV, CNN, Star TV, BBC, channel music, Astrologer, Local guide on request, Internet Access, Pet Corner, Home Theatre. Welcomgroup Mughal Sheraton in Agra is the proud recipient of the prestigious 'Aga Khan' Award for Excellence in Architecture and British Safety Council’s Sword of Honour Award. The sandstone and red brick building captures the Mughal royal magnificence with touch of marble, landscaped gardens and water bodies. 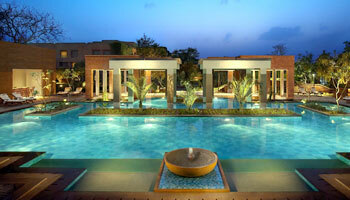 Welcomgroup Mughal Sheraton is a popular Five Star Hotels in Agra. There are 285 rooms in Welcomgroup Mughal Sheraton in Agra which includes 5 suites comprising of 3 Deluxe Suites and 2 Presidential Suites. 11 rooms of the hotel overlook the brilliant architectural monument, The Taj Mahal. Exquisite interiors, impeccable service, extraordinary cuisine, and contemporary technology come together to create an experience that is both grand and intimate at The Mughal, Agra. Maikhana - The elegant lobby bar and also serves snacks and special coffees and cold beverages mocktails and cocktails. What do you think about Mughal Sheraton Agra? Stayed here during our trip to India. Lovely entrance and the pool was great, nice cushioned sunbeds with lovely red and white thick towels. Room was grand and aircon working well.Towels clean and replaced regularly. Food at buffet very good with plenty of choice. This hotel is a great deal especially with the "internet special" for with starwood site. Its good to experience a high price hotel with all the frills for the price of $150.00 USD. There's lots of stuff to do within the hotel for a mini vacation....especially on the grounds. We really did not want to have the buffet dinner as other options at the hotel seemed better but we were hungry after a full day of tours...it was OK.
Beautiful hotel. We had a lovely room overlooking the fountains, garden and swimming pool. The room was very well appointed, clean and comfortable. Service was very good. Food was good, but not excellent. The view of the Taj from the roof terrace is fabulous! This is an excellent luxury hotel for which you pay a price but it was still good value for money. Great bonus is that if you arrive on the early train from Delhi, arrives about 8.15am, you can book in after 8am and not pay for the night before. This was a fantastic luxury, to freshen up and have tea, in the room, all provided or breakfast in the restaurant, charge made. The room was clean, good AC, good size, not huge but very pleasant, nice en-suite. The bed was truly magnificent - where do they get the pillows from! Hotel facilities were excellent, very nice pool and grounds, with volleyball, tennis, table tennis and quads with a purpose built track (required payment). Situated conveniently for Taj, Agra fort etc. Breakfast service was slow; too many staff who could only single task, but ample choice and who is in a rush anyway! It was much better on our second day. We had 1 lunch and the service was also slow, really down to the staff whom are plentiful but unable to provide quick service. In the evening, eat in the Peswari, North West frontier food with fingers, cutlery available on request, excellent, very good helpful service; you need to book if the hotel is busy. We travelled privately so cannot judge food in the restaurant where the tour companies eat. All in all luxury hotel and you pay luxury price but well worth it. This hotel had good rooms and pleasant staff except in the dining rooms. The food was inedible and service very slow. The dinner buffet was uninspiring and the multi-national restaurant served inedible food- NEVER AGAIN! Sterling April 2008:“Luxurious oasis” We got a great deal for our stay on the shreaton usa website. Our room was very comfortable and excellently equipped and standard of service excellent. Buffet breakfast had great range of fresh attractive food. Evening meals average and expensive. Roof garden and view of Taj Mahal a real oasis in the evening. Lovely pool. The initial welcome was efficient and welcome drinks were provided as we were being booked into our rooms. The staff were all friendly and warm. The grounds were well maintained and nicely spaced out with pleasant green leafery. There were a good range of activities for children (badminton, quad biking, swimmimg etc). There were four restaurants on the grounds and we can recommend the buffet. We were generally impressed by the overall service, presentation and warmth of the environment. My sister, father and I initially booked to stay for 3 days at the hotel. Unfortunately due to ill health we ended up staying 5 days. The hotel right from the initial booking contact were exceedingly helpful and friendly. They accommodated us by giving us adjoining rooms so my 89yr old father didn't have far to walk to meet us. We were given a wheelchair for indefinite use whilst we were at the hotel. Bell boys were virtually falling over themselves to help us when my father came in sight in the chair. When we called for a doctor they contacted one immediately and he was there at our room within 30minutes. There were only 2 things my father was not keen on , one the a/c(felt it was canned air!) and secondly that the hotel complex was too big and things too far away. A lift between floors would have helped him rather than all the stairs. There were no restaurants at ground level, they were either in the lower ground floor or on the 1st floor meaning he was forced to use the service lift and enter restaurants via the back door. Breakfast was excellent and the Chef made excellent muffins!! Our stay was fairly pricey but would stay again hopefully on a cheaper rate. As an aside, the hotel is trying to be eco friendly and using an electric "tuc-tuc" for ferrying guests about if they want to be adventurous instead of a gas guzzling air conditioned taxi. John Los Angeles Dec 12, 2007: "Wonderful place"
We stayed for 3 nights. Overall, it was a good experience. The staff was very friendly. The restuarants in the hotel were pricey but the quality of food and service was good. The amenities were good and this hotel indeed belongs in the luxury collection. The guide provided by the travel agency in the Hotel was good. However he took us to a store after visiting Taj Mahal that was extremely expensive. We found much cheaper and durable stuff in other government owned stores. Its better to shop on your own. London Nov 19, 2007 : "What a view!" you would expect from a 5 star hotel, and the room was really well equipped with everything from cotton buds to shoe polish. The room was really nice, quite big and quiet. We welcomed having a swimming pool, quite rare in city hotels. There was a choice of restaurants and the breakfast buffet had a good selection. Couldn't ask for more. The room was large and extremely comfortable. They have a floor couch that is really not too practical, but it looks nice. Staff were most helpful and the food in the dining room was good. The pool is in need of repair (tile, etc. ), but the hotel said that this problem was being addressed. We had en excellent stay at this true 5-star hotel. We come from Scandinavia - even the very best and most expensive hotels here are not anywhere near the Sheraton Mughal. It has anything you would expect from a top-class hotel, and a lot more. And the price? We payed USD 105 per night. We arrived late afternoon after a long train journey from Jaipur but were quickly booked in and taken to our room via a view of the Taj in the smoggy distance. Room was comfortable and had all the facilities expected of a top hotel. Staff were welcoming and efficient throughout. There was a choice of restaurants to eat in but we focused on the multi-national buffet menu which was welcome after a weekend of non-stop Indian food. Gardens were interesting to walk round although they were somewhat limited by building work and preparations for a concert. There was a decent swimming pool well away from the noise and bustle of this busy hotel. We stayed for two nights, and although it was not a cheap hotel to stay in, we enjoyed our stay and would have liked to stay for more.